Mook Review: The Leftovers | mookology. September 15, 2014 September 16, 2014 / Mookology. I really, really enjoyed The Leftovers. Tom Perrotta (of Little Children fame) writes a beautiful depiction of post-rapture life in suburbia, complete with teen angst, cults, love, and betrayal while somehow managing to come across in the most subtle of ways. Perrotta’s fictional Mapleton, and those who reside there, are well rounded characters that represent all types of coping methods. Some look for answers, others lead the community, many try to forget, and a certain group hinges on brutal remembrance. While I didn’t find the plot incredibly riveting (it was slow and stagnant at times) I felt myself drawn to this book. I wanted to get to the end. I needed to know what happened. The story centers around the Garvey family; a family that becomes less and less like the nuclear clan one typically thinks of when they hear that word. Kevin, the father and leader in more ways than one, internalizes his desperation to hold his family together. After his son disappears to follow a religious movement under the figurehead Holy Wayne, and his wife joins a cult-like group called the Guilty Remnant (whose focus is to provoke the memories of lost loved ones and prove the meaningless of life post-Rapture), Kevin tries to hold on to his daughter, Jill, who is depressed and lost in light of the situation. The Garvey’s are nothing spectacular, but an accurate representation of the American-dream family after trauma. Disjointed, disconnected, and disturbed. And although their unit remains in tact after the Sudden Departure, unlike many that had been torn apart, the Garvey’s still find it nearly impossible to go on. The Guilty Remnant was the main part of The Leftovers that really drew me in. Historically, I enjoy learning about cult-like phenomena and find so many aspects of it interesting. I am sickly fascinated by it. Perotta did a great job of bringing a fictional cult to life and I found myself more invested in Laurie’s chapters than others. Ending the leftovers in the way he did, Perotta left a lot to the imagination. I typically don’t like ambiguity in my books as I prefer to have a concrete ending, however I didn’t mind this one so much. It was fitting for the characters, the plot, and the setting. I definitely recommend this read. I knew before watching the series that it was going to be very different. 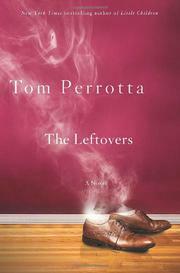 A novel like The Leftovers was too final and ambiguous to translate to TV without many changes. In many ways, turning The Leftovers into a series really did not make sense. Despite this, I had a good feeling about the show for three reasons… 1) The author was heavily involved in making it, so the integrity of the story had hope to stay the same 2) LOST was arguably the first TV series where people became obsessive, binge watched, and actually took TV seriously and 3) HBO typically produces amazing, award-winning series’. For the first few episodes, I was thrown off. I had a lot of questions about the surface-changes made (Why make Kevin the Chief of Police rather than Mayor? How come Jill didn’t shave her head? Did they really have to make Pastor Jamison into Nora’s brother?) But as the series went on I began to realize in order for the series to be successful on its own, the creators of the show needed to make certain liberties. Kevin transforms from the desperate, and sometimes boring, Father in the books to a strained, and perhaps crazy, police officer on screen. As different as the character appear, Kevin still tries to hold onto any sense of normalcy and succeeds as the lead actor (and Justin Theroux being smoking hot has almost nothing to do with it). By the last few episodes, I was not only hooked, but found myself enjoying the show even MORE than the novel… which almost never happens. That isn’t to say I find the television series better, necessarily, than the book. They are quite different. The one part of the book I wish had more presence (or a stronger presence) in the show would be Holy Wayne. While in the book this convention has depth and complexity, it doesn’t translate well on screen. I do strongly believe that The Leftovers on HBO will last many seasons and pick up more viewers as they go on. I was very impressed by season one and I am itching in my seat for season two – I can’t wait to see what they have in store for the residents of Mapleton.